Half of the top 20 girls are up tonight. But this half will be halved by the end of the night–only five make it through to the next round. Here’s hoping Vegas rocks! Tonight I am HOPEFUL that we will see awesome performances. 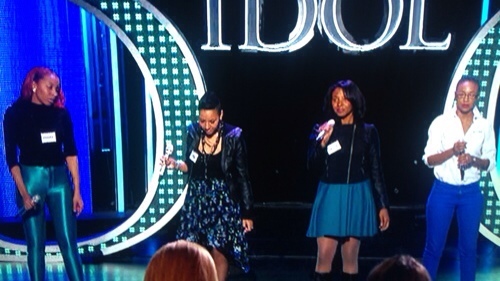 And according to the Jordin Sparks intro, Idol is selling this season on girl power, too. Let's go, Hollywood! Angela Miller – Set Me Free (original) – So she sang an original and played the piano with the band, and sounded awesome! She is 18, and not only does she have great songwriting ability but the chops to back it up. Like Taylor Swift but better? I like this girl. And I agree with Nicki, that Angela was not really on anyone's radar until she walked out on stage and made a name for herself. That is called bringing it! Candice Glover – This Girl Is On Fire by Alicia Keys – I think she is becoming good old reliable Candice. She comes out there every time and hits it out of the park. Her runs are effortless, the works great with the band, works the stage well, and is just basically awesome. After last week with the boys, this week's episodes focus on the ladies in Hollywood. Apparently, there were many more girls sent to hollywood than boys–lets hope that is indicative of the winner? Please teenage girl supervoters? During day one, the large group was cut down to 73 girls in groups. Since we didn't really see a whole lot of singing, I will cut to the goodness of the group performances. 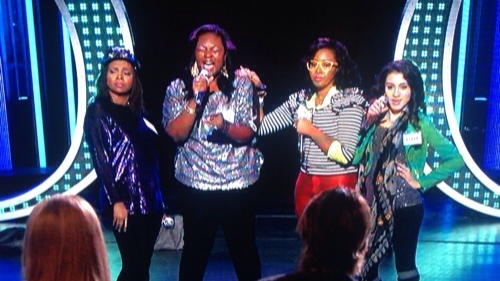 The Swagettes, including Kamaria Ousley, Melinda Ademi, Candace Glover, and Denise Jackson sang Hit Em Up Style…Candace is just amazing – seriously I have no idea how she got cut last year. 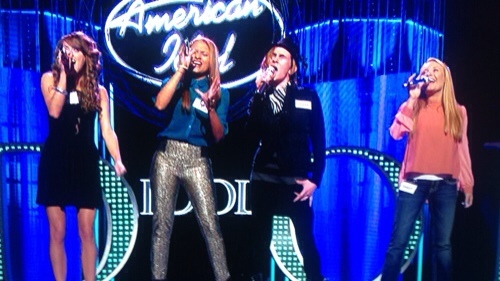 In this group, Melinda was the weak link, but overall it wasn't bad and their harmonies were fantastic. They all made it through to the next round. Almost Famous including Savannah, Lizz, Daysia, and J'Leigh sang a hot mess of a performance of Somebody I Used To Know. There was a tad bit of drama there and fortunately only one of them made it through. The Dramatics led by Cristabel and her crew somehow managed to all make it through. 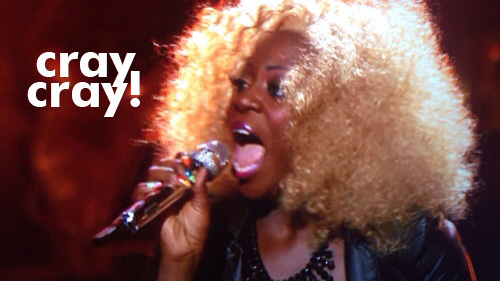 Cristabel, though, is awesome and girl better make it to the live shows, because I anticipate she'll do great! Urban Hue, including Seretha, Kiara, and Tenna sang American Boy. Although I use the word “sang” loosely. Unfortunately, Seretha goes home after a hot mess of a performance. Who Snaps, including Zoanette sang Knock On Wood, and was a hot mess, but in an entertaining sort of way. Next up, Liz and her missing group sand Gotye and was also a hot mess. After that, the group For You also murdered Gotye. Poor Gotye! 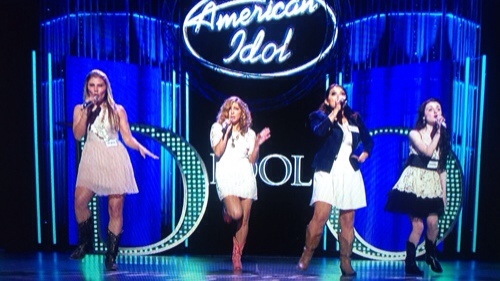 The Dolly Chicks including Brittnee Kellogg, Kree Harrison, Brandy Neely, and Haley Davis, sang Sin Wagon. The performance wasn't as messy as other ones, but not great either. All of them made it except for a classy Brandy Neely, who I am guessing will be back next year. The Misfits, including Kez Ban, Brianna Steer, Angela Miller, and Janelle Arthur sang Be My Baby. I don't know if it was the best harmonized performance, but it was very entertaining. Kez is a bit of a loose cannon and her voice wasn't at 100%, so I am curious to see how she'll do tomorrow. All the girls made it through to the next round, and previews hinted that Angela will have a breakout performance tomorrow! Bring on the memorable performances! So having watched all of the group performances, there were no real stand-outs like in previous years, which saddens me. You know I always love a great notable group performance (Kimberley and Frenchie, baby!) We'll see how the final performances go tomorrow. Did you see any standouts? Were you traumatized by the trainwrecks? Let me know in the comments! Oh Hollywood Week, how I love thee. The awesomeness and the trainwrecks all wrapped up into one. This year, Hollywood has been separated by gender – the boys are up first this week, with the girls to follow next week. 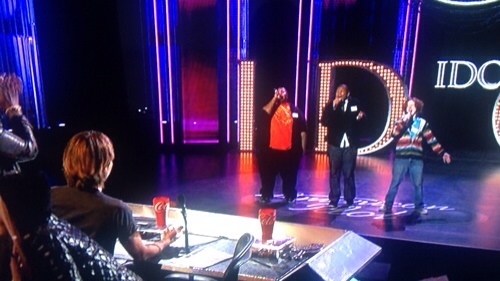 First round, per usual, is 10 seconds a capella, sudden death eliminations to follow. Then, for the first time, the producers form the groups…at least that eliminates 20% of the drama! But lets get down to the performances, shall we? The first group of Nick Boddington (who is back from last year) Mathenee Treco, Mattheus Fernandes, Gabe Brown sang Somebody to Love. They were fantastic! 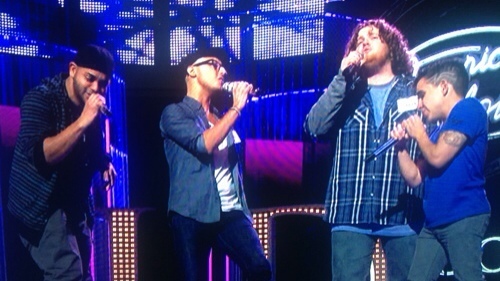 Especially Gabe…I was worried that he had no control of that crazy voice of his, but I think he does….rock on, man! Next up, the group known as Normal Hill – Johnny Keyser and Kareem Clark and friends sang I'll Be There and it was a trainwreck! Charlie Askew, Curtis Finch Jr. and an unnamed group member sang the Lazy Song, and it was ok, but slightly erratic at times. Curtis is just awesome, though. Tonight we enter the Hollywood Week episodes! This is like my Idol Christmas – I look forward to Hollywood Week every year. While you are watching throughout these episodes, which are sure to be both awful and awesome, keep an eye out for these contestants in my “Twelve Ones to Watch” list (in no particular order). She auditioned last year and had a famous rockin’ performance with Ms. Jessica Sanchez and Deandre where they all Rocked. It. Out. Remember? Well, she’s back, and she is a major contender. This time around she sang a Duffy number and sounded phenomenal. Nicki said she wanted to skin her and wear her–they should just advance her to the voting rounds right now, to save her from Nicki’s prowling ways. I admit it, I was fooled by the Idol producers. Fire twirling and combat boots does normally not precede a good audition, but that does not apply here. She is a little bit of a strange one, but is amazingly awesome. And she gets props for complaining to Seacrest about having to fill out paperwork. Her authenticity cracks me up!